Eddie is a super piano teacher. He’s a cheery man who inspires his young pupils to be the best they can be. My daughter loves her weekly piano lessons and i’m delighted with her progress after only a few weeks. Thank you Eddie. Eddie Makes Learning To Play The Piano Fun! Julie really enjoys her Piano lessons with Eddie. I used to have to remind her to practise ever single day with her old teacher. Not now. She jumps straight onto the Piano to practise as soon as she gets home from school. Im delighted with the standard of tuition she receives from Eddie. Thanks for taking my daughter on she thinks your’re great! This past twelve months or so, it’s been a real up-hill struggle to get my son to go to Piano lessons, let alone get him to apply himself practising. Ian had become totally bored with the whole concept of learning to play the Piano, thanks I might add, to his pervious teacher. 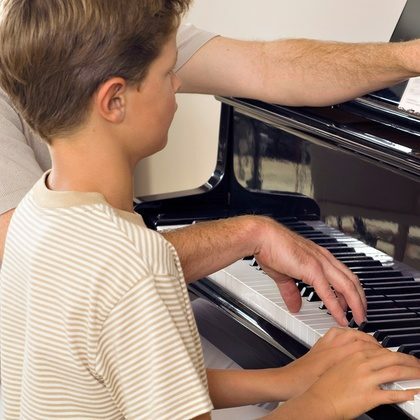 Like many parents we trusted our old Piano teacher to educate our son. After a lengthy discussion with Ian we found out during his Piano lessons he just played the same piece over and over again, when he should have been taking on new skills. Eddie has stepped in just in the nick of time, creating structure for my sons lessons, giving him bags of encouragement. Thank you so much Eddie. We have only been using Eddie Rudak for a couple of months; but already we can tell that our Son is making steady progress and just as importantly, is enjoying his Piano lessons. My children love learning to play the Piano with Eddie. Eddie teaches both of my Girl’s at our home in Derby. He is clearly a very knowledgeable man who’s studied his craft well. My daughter’s really enjoy their weekly piano lesson. I never need to remind them to go practise either! I’m so glad that we found Eddie, he’s heads above the last Piano teacher we had. My Daughter, Millie, is really enjoying her Piano lessons with Eddie. She’s been playing for only a few weeks and is thoroughly enjoying learning to play the Piano. I was recommended to Eddie by a friend, who’s daughter also goes to Millie’s school. Every lesson is made enjoyable by this lovely patient man. I’ve been having piano lessons with Ed for about 3 months now. What an amazing teacher he is, every lesson is well structured and challenging and set at a pace that suits me perfectly. Ed gives fantastic support, is always enthusiastic and the lessons are consistently enjoyable. He’s always willing to answer any questions at any point throughout the week. As a beginner, I have progressed enormously in the last few months with Ed’s help at all aspects of playing the piano. I am so very glad to have him as my Piano teacher. Thank you Ed. Highly Recommended as a Piano Teacher. Fabulous piano teacher. He has been teaching my daughter piano for over two years and my daughter has made excellent progress. He is a professional, kind and highly skilled individual, who will get the best out of your child. He also does not put up with any nonsense and demands that his students put effort into this instrument. Highly recommend him as a Piano teacher! Mrs. Heidi Lee. Littleover, Derby. Eddie Makes Learning Piano Fun! Ed has been teaching my 6 year old son for just under a year now, he has a wonderful approach with children and has made him feel at ease and eager to learn from day one. My son loves his piano lessons and always looks forward to the next because Ed makes learning the piano fun!! Ms. Laura Jackson. Derby Central. I decided to take lessons in my retirement fulfilling a lifelong wish. Eddie has such a deep professional understanding of individual needs and is helping me fulfil my dream. I am really encouraged and I am progressing slowly but surely. Thank you Ed for your continuing patience and support. Mrs. Pauline Harris. Allestree, Derby.